Please note that the content of this book primarily consists of articles available from Wikipedia or other free sources online. The protein encoded by this gene is one subunit of a trimeric complex, forming a highly conserved transcription factor that binds to CCAAT motifs in the promoter regions in a variety of genes. Subunit A associates with a tight dimer composed of the B and C subunits, resulting in a trimer that binds to DNA with high specificity and affinity. The sequence specific interactions of the complex are made by the A subunit, suggesting a role as the regulatory subunit. 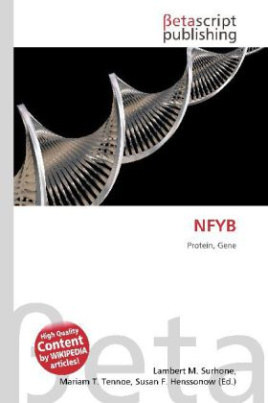 In addition, there is evidence of post-transcriptional regulation in this gene product, either by protein degradation or control of translation. Further regulation is represented by alternative splicing in the glutamine-rich activation domain, with clear tissue-specific preferences for the two isoforms.